An O.E. part is a vehicle part that is fitted to the vehicle in production. These parts are typically the highest quality available as the manufauture do not want their new vehicles to break down within the first few years of life. In aftermarket parts, there are O.E. specification parts (or O.E. Spec) which are made to the same standard that the manufacturer specified but are usually made for volume and with costs in mind. In batteries, the Exide Premium range is a O.E. Spec Battery; made to the same specification as the O.E. battery whereas the Banner Pro is made on the same production line as the O.E. battery; these are the same as the original unit fitted at the factory. In effect, this is the very highest quality battery on the market. 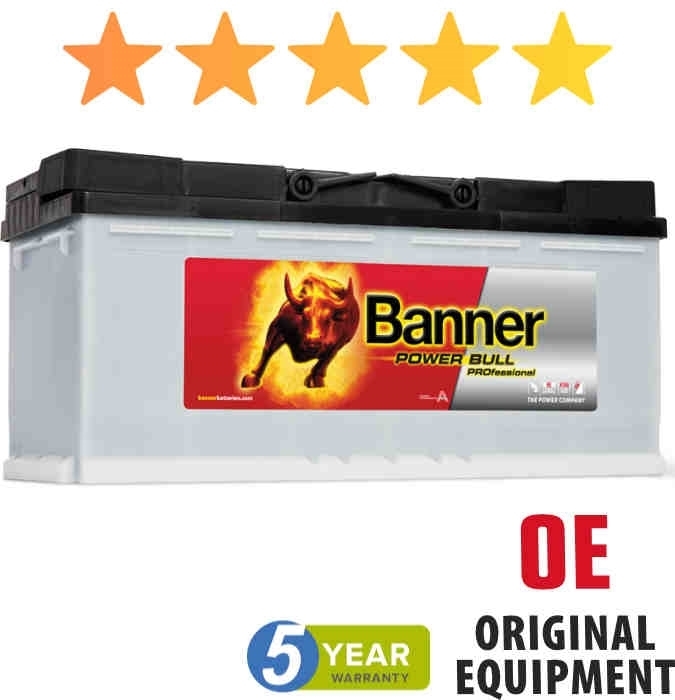 The Power Bull is the flagship for Banner brand quality and THE choice for modern cars. A claim supported by the top ratings obtained during the independent battery tests of leading European automobile clubs. 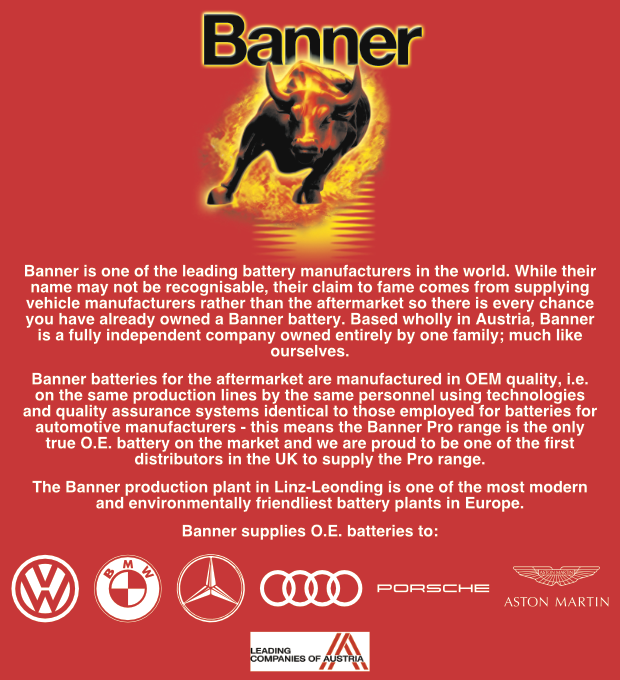 The Banner Power Bull answers the steadily increasing demands created by ever-higher, on-board power consumption and is therefore employed by car manufacturers such as BMW and VW for first fitting. Calcium / calcium technology and the Double Top lid mean that the Power Bull offers greater safety, improved deep charging capacity and easier charging. The new top versions of the Power Bull PROfessional with increased performance are based on proven Power Bull technology and fulfil precisely the requirements of leading German automotive manufacturers. These power packs are designed for modern cars with very high energy demands but without a start/stop system. Absolute maintenance-free owing to calcium technology. Increased starting power - maximum safety - improved deep charging capability - easier charging. Safety in the fast lane. The Power Bull’s patented Double Top leak protection ensures absolute safety at angles of up to 55° and even survived the tough roll-over test according to VW standards. Improved protection against backfiring and electrostatic discharge (ESD), as well as flexible gas vents, mounted on both sides, round off the Double Top safety package in style and help to also make the Power Bull, as well as ideal for SUVs. What is a Ampere, or Amp? What is a Ampere-hour or Ah? 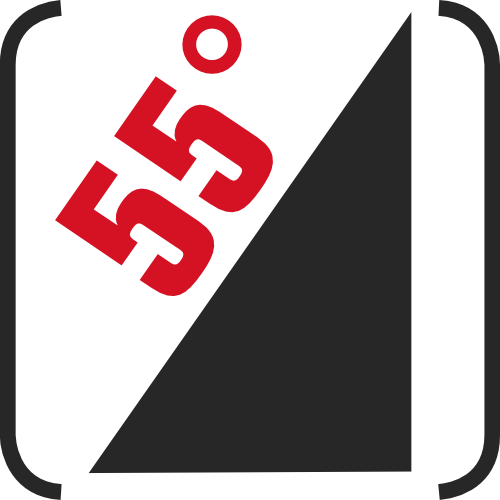 What does Cold Cranking Amperes (CCA) mean?